So you think you are talented…!?! – follow @zippyfresh On IG. – Download “NO” by zippy. – Upload a 1mins video of your #NoCoverChallenge on IG. – Use the hashtag #NoCoverChallenge. – Competition is for 4weeks only. 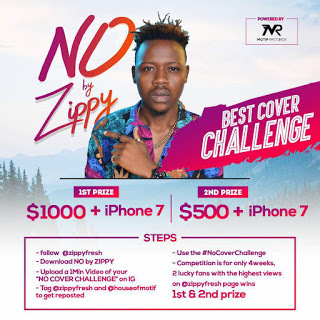 – 2 lucky fans with the highest views on @zippyfresh IG page wins. – 2nd wins €429 + iPhone7. ANTICIPATE “NO” VISUALS DROPPING SOON.